New York State has over 2,000 miles of shoreline along the Great Lakes and around Long Island. More than 160 rivers and streams, 120 lakes, and 65 reservoirs and dams are in New York. Besides Lake Erie and Lake Ontario, other major lakes include Lake Champlain, Lake George, Oneida Lake, and the Finger Lakes. The boundary between New York State and some of its neighbors is marked by the Delaware, the Niagara, and the St. Lawrence rivers. Other major rivers include the Genesee, the Hudson, the Mohawk, and the Susquehanna. About 13% of the state (7,342 square miles) is covered by water including its offshore waters in the Atlantic Ocean and its system of canals. What is New York's maritime heritage? With its complex network of waterways, New York State has a rich maritime heritage. The archeological record in the state represents 12,000 years of human activity following the last glacial period in North America. The historic record extends back to 1609 when Henry Hudson sailed into what is known now as New York Harbor on behalf of the Dutch East India Company. The prehistoric and historic sites on land and underwater in New York State represent a continuum of native and non-native settlement, defense, and commercial development. Information on more than 1,000 shipwreck sites and reported losses is recorded in a database maintained by the state but there may be as many as 10,000 shipwrecks in state waters. In the Atlantic Ocean and Long Island Sound, there are shipwrecks from the early colonial period to World War II. In Lakes Erie and Ontario, there are sunken 18th century warships, commercial sailing vessels, and World War II aircraft. In Lakes Champlain and George, there are naval ship losses from the French and Indian War through the War of 1812. They and other inland lakes contain the wrecks of canal boats and steamships; and the state's rivers and harbors are littered with the wrecks of sloops, schooners, barges, steamboats, tugs, and harbor craft from the 17th - 20th centuries. The Land Tortoise in Lake George is one of the nation's oldest shipwrecks. This colonial radeau was constructed in 1758 by American provincial troops allied with the British and the Iroquois against France. 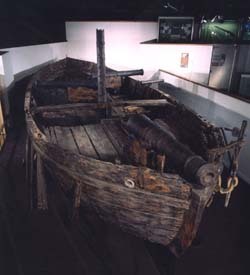 It was intentionally sunk in 1758 for storage over the winter but sank too deep and was not recovered. It was discovered in 1990 and studied for four years by a team of volunteer divers working with a professional archeologist. The shipwreck is a National Historic Landmark and protected in the Land Tortoise submerged heritage preserve. One well-preserved shipwreck from the American Revolutionary War is the Continental gunboat Philadelphia sunk in 1776 during the Battle of Valcour Island in Lake Champlain. Located and raised in 1935 and bequeathed to the Smithsonian Institution in 1961, it is in the collection of the National Museum of American History in Washington, DC and is a National Historic Landmark. A British loss from the same time period is the warship HMS Culloden run aground during a severe winter storm in 1781 at Montauk while trying to intercept French ships allied with the Americans. The shipwreck was discovered in 1971 and listed in the National Register of Historic Places in 1979. The East Hampton Marine Museum in Amagansett tells the story of the ship's loss and displays some artifacts. Examples of ships lost in the 19th and the 20th centuries are the side-wheel steamship Lexington lost in a catastrophic fire with great loss of life in Long Island Sound in 1840 and the USS San Diego that suffered an explosion and sank in 1918 southeast of Fire Island, the only major United States warship lost in World War I. Who takes care of New York's underwater archeological sites? The Office of General Services is custodian of state-owned submerged land and issues land use permits for various activities on that land including submerged heritage preserves. The State Museum in the Department of Education is custodian of underwater archeological sites on state submerged land and issues permits in conjunction with other state agencies for research at sites on that land. The Office of Parks, Recreation and Historic Preservation administers the state's historic preservation program and coordinates archeological surveys including surveys of the state's waterways. The Department of Environmental Conservation is responsible for conserving, improving and protecting the state's natural resources and environment and, in this capacity, administers submerged heritage preserves in Lake George. The Department of State manages the state's coastal management program and provides grants for local waterfront revitalization including development of Blueway Trails and Underwater Blueway Trails. The Office of the Attorney General protects and defends New York State's interests in its cultural resources including underwater archeological sites. Representatives from each of these agencies sit on an ad hoc committee on underwater resources that serves as a clearinghouse for shipwreck issues and a forum for coordinating agency responses and policies. Members of this committee also sit on the Hudson River Estuary submerged historic resources committee. Along with representatives from the Lake Champlain Maritime Museum, the State University of New York at Stony Brook, and the National Oceanic and Atmospheric Administration, this committee is developing a plan to identify, evaluate, document, protect, and interpret some 900 shipwrecks in the Hudson River. You need a permit from the State Museum to conduct archeological research on state land including shipwreck sites on state submerged lands. Applications are reviewed by an interagency panel to ensure that the proposal meets scientific requirements, abides by museum policies, and complies with other state laws. The state agency that administers the land on which the site is located also must give its approval which, in the case of state submerged land, is the Office of General Services. Materials recovered under authority of a permit remain state property and must be cared for in accordance with the state's policies regarding collections. Are there any underwater parks in New York? In cooperation with regional partners, New York State has created underwater historic preserves in Lake Champlain, Lake George, and Lake Ontario. The Champlain II preserve is in Lake Champlain; the Sunken Fleet of 1758, the Forward Underwater Classroom, and the Land Tortoise preserves are in Lake George; and the David W. Mills preserve is in Lake Ontario. The Great Lakes Seaway Trail is a National Scenic Byway in New York and Pennsylvania that features a Dive Trail with shipwreck sites including the freighter David W. Mills. Some other sites on the Dive Trail include the schooner St. Peter and the freighter Homer Warren in Lake Ontario and the car ferry Wolfe Islander II in the St. Lawrence River. What laws concern underwater archeology in New York? The New York State Consolidated Laws can be accessed online through the New York State Legislature search engine. The Public Lands Law establishes the responsibilities and authorities of the Office of General Services concerning state-owned land including submerged land. The Education Law establishes the State Museum in the Department of Education as the repository for state-owned archeological, historical, and scientific specimens and collections, and establishes a permit process for authorizing archeological survey and excavation. The Parks, Recreation and Historic Preservation Law establishes the responsibilities and authorities of the State Parks, the State Historic Sites, the State Heritage Areas, and the State Historic Preservation Office. The Environmental Conservation Law establishes the responsibilities and authorities of the Department of Environmental Conservation. The Executive Law establishes the Department of State, and Article 42 of the law authorizes the program to revitalize the state's coastal areas and inland waterways. New York State considers that its historical, archeological, architectural, and cultural heritage is among its most important environmental assets and that it should be preserved. Through its comprehensive historic preservation program, the state promotes, encourages, and coordinates activities that protect, enhance, and perpetuate its heritage resources including its submerged heritage resources.